Louisville, Kentucky (September 1, 2016) – Louisville Distilling Co. LLC, producers of the highly celebrated Angel’s Envy super-premium bourbon, will once again Toast the Trees this September in celebration of National Bourbon Heritage Month, to help ensure that there are always enough American white oak trees for future generations of whiskey lovers. Angel’s Envy is proud to continue its partnership with The Arbor Day Foundation—now in its third year. Angel’s Envy will plant a white oak tree for every Angel’s Envy drink that its fans share this September—neat, on-the-rocks or in a cocktail. 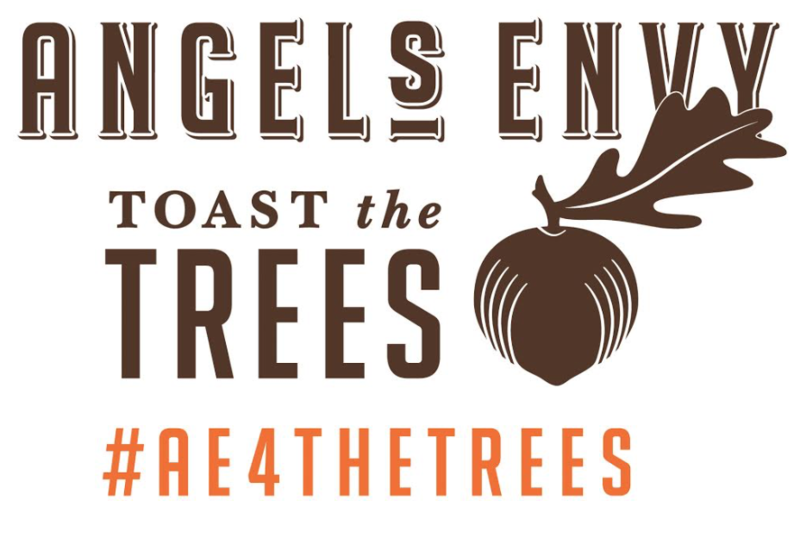 To plant your tree, simply snap a picture of your drink and share it to Facebook, Instagram or Twitter with the hashtag #AE4THETREES, and Angel’s Envy will work with The Arbor Day Foundation to ensure that a tree is planted. Additional opportunities will also be available through the Angel’s Envy newsletter, which can be joined through the brand website at www.angelsenvy.com. This year’s program builds on the successful social media initiative last year which culminated in the planting of 4,000 white oak trees to help restore the original composition of the Daniel Boone National Forest in Laurel County, Kentucky, and to make the site more productive for wildlife. The small batch artisan bourbon is the culmination of the late Master Distiller Lincoln Henderson’s storied career. One of the original pioneers of the premium bourbon and whiskey categories in the U.S., Lincoln came out of retirement to create the world’s finest bourbon on his own terms – with a simple desire to enjoy the art of making whiskey. In addition to the flagship bourbon port cask finish, the Company offers Angel’s Envy Cask Strength and Angel’s Envy Rye. Each Expression exhibits a passion for experimenting outside of conventional norms and producing unique whiskey steeped in tradition, but finished with a twist. Bourbon Whiskey Finished in Port Wine Barrels, distilled for an unparalleled smoothness, aged for 4-6 years in American white oak barrels and finished in hand-selected port wine barrels for an incremental 3-6 months. Now available across the U.S., the expression earned a 98/100 points from Wine Enthusiast magazine – the highest-ever rating for a bourbon – and five stars (highest recommendation) from F. Paul Pacult’s Spirit Journal. Cask Strength, aged to the perfect level of richness and maturity in the few American white oak barrels that made the cut (and are available each year) and then finished in port wine barrels for up to 18 months. The inaugural releases sold out in weeks. Paul Pacult of Spirit Journal named the Cask Strength “Best Spirit in the World,” giving it five stars and noting it “deserves a sixth rating star.” Available in select U.S. markets for the suggested retail price (750ml bottle) of $179. Rye Finished in Rum Barrels, made with 95% rye and 5% malted barley that’s aged for as much as six years in new American, charred oak barrels and finished in hand-selected Caribbean rum casks for up to 18 months. Both The Tasting Panel and Wine Enthusiast magazines awarded Rye with 94/100 points. Available in select U.S. markets for the suggested retail price (750ml bottle) of $79.99. For more information, please visit us at www.angelsenvy.com or on Facebook https://www.facebook.com/AngelsEnvyBourbon and twitter https://twitter.com/Angels_Envy (@angels_envy). The ANGEL’S ENVY™ brand is part of the portfolio of Bacardi Limited, headquartered in Hamilton, Bermuda. Bacardi Limited refers to the Bacardi group of companies, including Bacardi International Limited. Angel’s Envy™ 2016. Heaven Can Wait. Please Drink Responsibly. Founded in 1972, the centennial of the first Arbor Day observance in the 19th century, the Foundation has grown to become the largest nonprofit membership organization dedicated to planting trees, with over one million members, supporters, and valued partners. The impact we make on our world is accomplished through our conservation and education programs.